Louisville may be getting Google Fiber soon, but the Kentucky city recently introduced another innovative means of providing Internet access to areas of the city where public WiFi hotspots are limited. 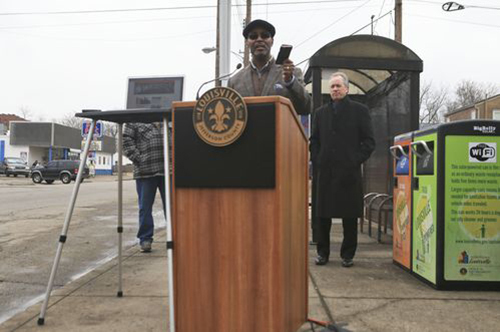 Solar-powered dumpster-sized trash cans are being outfitted with WiFi offering free wireless 4G Internet access. This unique combination of functionality offers the potential to be a solution for many cities looking to bring the Internet to more disadvantaged areas of their communities. While the WiFi hotspots are limited to around a 100-foot radius, their location close to popular bus stops brings the hope they will see wide use by commuters and residents who live near the hotspots. Let’s take a closer look at this creative experiment in public Internet access. The dumpsters in question are Big Belly trash compactors that have been repurposed with solar-powered batteries operating an Internet hotspot. To keep data safe, the city is using the same firewall technology in use at Louisville’s libraries and other places with public Internet access, according to Ted Smith, the city’s innovation chief. The individual units cost $4,000 each and are being paid for by a philanthropic grant instead of taxpayer dollars. So far, more than one-thousand users have accessed the hotspot consuming 100 GB of data. Louisville hopes to find a community partnership to take over management and expansion of the hot spots later this year. Louisville’s reasoning behind the public WiFi service isn’t entirely altruistic. The city government feels that connecting more of the city to the Internet could attract other ISPs to the area. Google Fiber is considering Louisville and is currently conducting site surveys, while AT&T recently announced their GigaPower service will soon be locally available. City mayor, Greg Fischer commented about his hopes for the service to the Louisville Courier-Journal. “When we show this demand, it demonstrates we’re more attractive to Internet providers. They want to see if there’s a market for their services,” said Fischer. With Google’s final decision on making Louisville a “Fiber City” still months away, it remains to be seen if the use of trash can dumpster WiFi to increase demand sways the technology giant. Considering Google’s own efforts in bringing the Internet to areas without access — most notably Project Loon — maybe Greg Fischer’s gambit pays off if the company feels sympathetic towards the new city program. There’s no denying the unique and innovative nature of the concept. It will be interesting to see if Big Belly sells more of their trash can hotspots to other large cities in the country.